Separation of Tensile and Shear Cracks Based on Acoustic Emission Analysis of Rock Fracture. The formation of shear fractures in granite and sandstone samples was investigated using advanced Acoustic Emission (AE) analysis. At the beginning of fracturing AEs were widely distributed in the samples. After fracture nucleation AE events appear more localized near the fault tip. We observed the narrowing of this AE process zone during fault propagation through the sample. Analysis of AE showed the decrease of a negative slope of frequency-amplitude distributions (b-values) prior to sample failure manifesting the enlargement of cracks during fracture propagation. We observed a decrease of the fractal dimension coefficient (d-value), indicating a spatial localization of the fracture process. Polarity analysis of AE showed that initially about half of all AE sources could be identified as tensile cracks. During fault propagation the percentage of tensile AE events drops to 5-10% and shear-type AE sources dominate during later stages of loading. Tensile events are more frequent at the tip of propagating faults than at the tail of faults. This indicates that fracture propagation includes two stages: accumulation of uncorrelated tensile cracks and appearance of shear cracks interconnecting a network of previously formed tensile cracks. Acoustic emission, Fracture, Process Zone, Rock. For most brittle materials tensile failure (Mode I) is predominant at low confining pressures, but at increasing confining pressures shear cracks and mixed mode cracking become more significant [Melin,1989]. As tensile fracturing is frequently observed in nature, it has been studied intensely, not only in terms of fracture mechanics, but also using acoustic emission technique [Glaser & Nelson, 1992; Zietow & Labuz, 1998; Labuz et. al., 2001]. On the contrary, shear fracturing has been less studied in the past, mainly due to a lack of reliable techniques to separate tensile and shear cracks. Recently a new method has been proposed that is based on the polarity analysis of AE first motions [Zang et. al.,1998]. It has been shown that even for Mode II or pure shear loading, a high percentage of tensile cracks has been registered [Stanchits et. al., 2003]. This contribution examines the results of AE analysis of fracturing in granite and sandstone samples subjected to loading in confining pressure conditions. Cylindrical samples of granite and sandstone of 50 mm diameter and 100 mm length were fractured using a servo-controlled loading frame equipped with a pressure vessel (Fig.1a). Sample top surface was partly covered with a steel plate inducing a high stress concentration, which initiated the fracture.Rupture propagation from the indenter is shown schematically in Fig.1c. To monitor microcracking of the rock, 10 piezoelectric transducers were glued to the cylindrical surface of the rock (Fig.1b). The data acquisition system is identical to that used earlier (Zang et al. 1998), and allowed to register fully digitised waveforms with 10 MHz sampling rate. To slow down the rupture process and investigate fault propagation in detail the acoustic emission rate of one sensor was used as a feedback signal to servo-control the loading piston. For AE rates below a certain trigger level a fixed displacement rate loading (0.02 mm/min) was set.When the AE rate became high enough - the displacement rate decreased significantly (10-10 mm/min). The threshold level of the rate control sensor allowed to vary the speed of fault propagation through the sample by three orders of magnitude, i.e. from mm/s in fixed displacement rate tests to mm/s in AE rate-controlled tests. 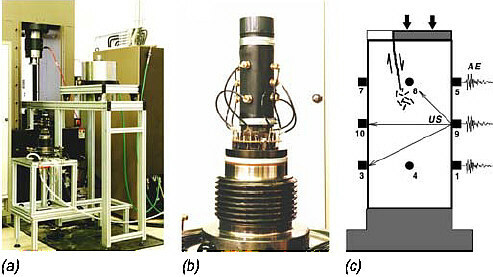 Fig 1: Experimental setup of triaxial indenter test. Servo-controlled 4600 kN loading frame of MTS Systems Ltd. with pressure vessel (a), core sample in rubber tube jacket with ten piezocemamic sensors (b) and scheme of confined shear rupture propagation (c). Investigated materials were a granite from Blauenthal, Germany and a sandstone from Flechtingen,Germany. The Blauenthal granite (Agr) consists of 30 vol% quartz, 40 vol% plagioclase, 20 vol% potassium feldspar and 10 vol% mica. The grain sizes vary from 0.9 to 1.8 mm with an average of 1.3 mm; isolated grains measure up to 10 mm.Porosity was 1.3%. Mineral composition of the sandstone (Fb) was mainly quartz (65-75 vol%) cemented by calcite and illite (15 vol%) with potassium feldspar (7 vol%) and plagioclase (6 vol%).Grain sizes were between 0.1 and 0.5 mm (average 0.18 mm), and initial porosity from 5 to 7%. After deformation cores were vacuum impregnated with blue epoxy resin and cut in two halves.From selected half-cores thin sections 50 x 100 mm in size were prepared. Crack microstructure inside the damage zone was inspected by light microscopy. Hypocentre determination from measured AE wavelet data was carried out using a least square iterative technique [Zang et.al., 1998]. For accurate location of AE events it is crucial to know the Pwave velocity distribution in the sample. Therefore, during loading of the sample we periodically performed ultrasonic transmission tests on the sample, applying an electrical pulse to some of the piezoelectric transducers and measuring the arrival times and amplitudes of elastic waves transmitted through the sample in different directions. The results of the ultrasonic test (Fig.2) showed a small increase of P-wave velocity at the beginning of loading, which could be explained by the sample compaction, and later velocity decrease, which indicates increasing sample dilatency. Using ultrasonic transmission results we performed an inhomogeneous anisotropic tomography inversion, and then applied calculated P-wave velocities to locate the AE hypocenters. Fig 2: P-wave velocity for different traces from ultrasonic transmission measurements in granite sample versus time of loading. Acoustic emission hypocenters, presented in Fig.3 were calculated from automatically picked onset arrivals. For a granite sample (Fig.3a) the first time slice corresponds to the fracture nucleation phase (stage 1a). Next two time slices represent fault propagation phases (stage 1b and 1c). During propagation the acoustic emission cloud first advanced in a subvertical direction (Fig.3a: stage 1b), but later deviated ~ 40 degrees from vertical (Fig.3a: stage 1c, dip 50 degrees). The fourth time section contains events only from frictional sliding (Fig.3a: stage 2). Sandstone hypocenters were separated into two fracture propagation sequences (Fig.3b, stage 1a and 1b) and two friction sliding time sequences (Fig.3b, stage 2a and 2b). 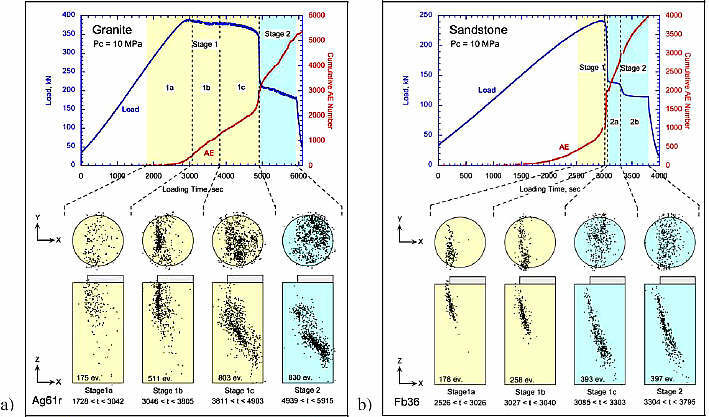 Comparing the location results of granite (Fig.3a) and sandstone (Fig.3b), we found the fracture process zone to be broader for granite than for the fine grained sandstone. Fig 3: Load-time curves and hypocenters of acoustic emissions. (a)Blauental granite, (b)Flechtingen sandstone. 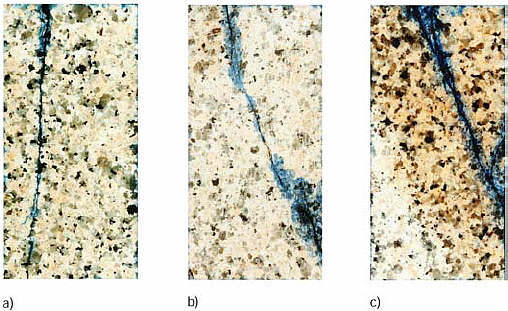 Fig 4: Fracture planes after indenter tests in epoxy-saturated half cores of granite at zero (a), 10 MPa (b) and 40 MPa (c) confining pressure. Traces of granite rupture planes after testing are visible from epoxy-saturated core halves (Fig.4). Confining pressure increases from left (Fig.4a, uniaxial indenter) to right (Fig.4c, triaxial indenter 40 MPa). Note that the rupture propagated into different parts of the sample depending on confining pressure (Fig.4). The kink in the rupture trace at 10 MPa (Fig.4b), also evident from acoustic hypocenter mapping (Fig.3a, stage 1b and 1c) was not found at higher confinement (Fig.4c). The results of statistical analysis of AE in case of granite sample fracturing at 40 MPa confining pressure are presented in Fig.5. Fractal dimension coefficient (d-value) was calculated as a slope of the correlation integral C(r), according to Hirata et. al., 1987. Decrease of d-value during fracturing (Fig.5a) shows that at the beginning of loading accumulation of microcracks is not localized, but during fault propagation the fracture process zone became more focused. Similar behaviour of the d-value was observed earlier by Lockner & Byerlee, 1995. Correlation coefficient (Fig.5c) was calculated according to Zang et. al., 1998 as the value of correlation integral C(r) at the distance 1 cm. Decrease of d-value (Fig.5a) was accompanied by an increasing correlation coefficient and a decreasing process zone width (Fig.5c). This may be interpreted as localization of the fracture process before final fault propagation through the whole sample occurred. Negative slope of cumulative frequency-amplitude distributions bvalue (Fig.5b) was calculated according to Gutenberg & Richter, 1954. Decrease of b-value (Fig.5b) confirms the enlargement of cracks. A similar behaviour of the b-value was observed for example by Lei et. al., (2000) during triaxial loading of a hornblende schist rock. 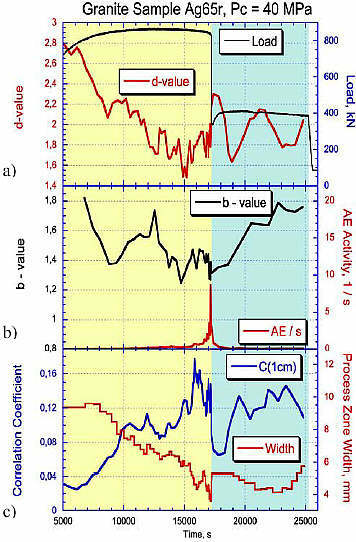 Fig 5: Loading curve and fractal dimension of AE d-value (a), slope of frequencyamplitude distribution b-value and AE activity (b), correlation coefficient and process zone width (c) versus time of granite sample loading, fractured at 40 MPa confining pressure. 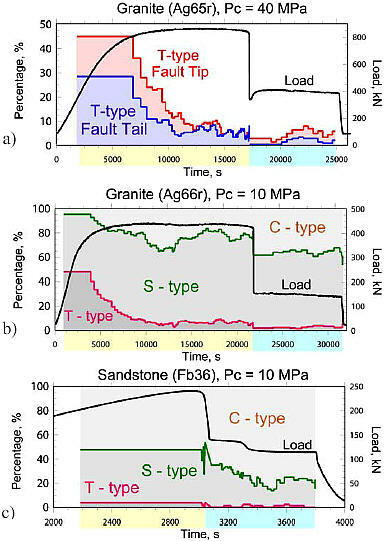 Fig 6: Percentage values of tensile (Ttype), shear (S-type) and implosion sources (Ctype) calculated from first pulse polarity statistics versus time of loading for granite at (a) 10 MPa, (b) 40 MPa and (c) sandstone at 10 MPa confining pressure fracturing. Therefore, in our experiments we observed classical features of fracture behaviour prior to the sample failure: localization of fracture in space, increase of event magnitude and acceleration of the fracture process in time. Using AE first motion polarities [as Zang et.al., 1998] we separated the signals into tensile, shear and pore collapse sources (Fig.6). We have found that at the very beginning of loading about 50% of all signals indicate tensile cracks. However the percentage of tensile cracks decreased during fracture propagation. We analysed separately the upper part of the samples and the lower part, containing the tip of the propagating fault. There was a higher percentage of tensile sources located at the tip of the fault (Fig.6a). Sandstone samples (Fig.6c) show almost no significant number of tensile cracks, but a large percentage of C-Type events, which could be interpreted as pore collapse. The propagating tip of a shear fracture in rocks is surrounded by a process zone, which is broader at the beginning of fracturing and becomes narrower during propagation and sliding stages of the fracture. We observed a decrease of the b-value prior to the main stress drop manifesting the enlargement of cracks. The b-value recovered during the sliding stage. At the beginning of granite fracturing about 50% of all sources can be identified as tensile cracks, but during fault propagation and sliding this percentage decreases significantly. Tensile sources are more frequent at the tip of a fault propagating through granite than near its tail. Pore collapse and grain crushing prevail in the process zone of sandstone and the amount of tensile cracks is much smaller than in granite. Glaser, S.D. & Nelson, P.P. 1992. Acoustic emissions produced by discrete fracture in rock. Part 2. Kinematics of crack growth during controlled Mode I and Mode II loading of rock. Int. J. Rock Mech. Min. Sci., 10, 53-67. Gutenberg. B. & Richter, C.F. 1954. Seismicity of the Earth, Princeton Univ. Press, Princeton, N.J. 310 pp. Hirata, T., Satoh, T. & Ito, K. 1987. Fractal structure of spatial distribution of microfracturing in rock. Geophys. J. R. astr.Soc., 90, 369-374. Labuz, J.F., Cattaneo, S. & Chen, L.H. 2001. Acoustic emission at failure in quasi-brittle materials. Constr. Build. Mater.,15, 225-233. Lei, X., Kusunose, K., Rao, M.V.M.S., Nishizawa, O. & Satoh, T. 2000. Quasi-static fault growth and cracking inhomogeneous brittle rock under triaxial compression using acoustic emission monitoring. J. Geophys. Res., 105, B3:6127-6139. Lockner, D. & Byerlee, J.D. 1995. Precursory AE patterns leading to rock fracture, in Proc. 5th Conf. on AE /Microseismic activity in Geologic Structures and Materials, 45-58, ed. Hardy, H.R., Trans-Tech, Clausthal Zellerfeld, Germany. Melin, S. 1989. Why are crack paths in concrete and mortar different from those in PMMA? Mater. Constr., 22: 23-27. Stanchits, S., Backers, T., Stephansson, O. & Dresen, G. 2003.Acoustic emissions and micromechanics of granite from tensile (Mode I) and shear (Mode II) loading Proc. EUROConference on Rock Physics and Geomechanics. September 2003, Netherlands. (in press). Zang, A., Wagner, F.C., Stanchits, S., Dresen, G., Andresen, R. & Haidekker, M. 1998. Source analysis of acoustic emissions in Aue granite cores under symmetric and asymmetric compressive loads. Geophys. J. Inter., 135: 1113-1130. Zietow, W.K. & Labuz, J.F. 1998. Measurement of the intrincic process zone in rock using acoustic emission. Int. J.Rock Mech. Min. Sci., 35, 291-299.